History Adventuring: Why Phoenix just can't go back to "the way it was"
Why Phoenix just can't go back to "the way it was"
I like old photos, and as long as I can remember people have often said that they wished that Phoenix could just go back to "the way it was". And I understand, it's a nice thought. As a time-traveler I wonder where in the timeline would be the best "way it was"? Before Phoenix was built, when the area was all just beautiful Sonoran Desert? Or back when the railroad had just arrived, in 1887, and the old adobe buildings were being replaced by beautiful new brick buildings? Of course most people want Phoenix to go back to the way it was when they were kids or when their parents were kids, which could be the '90s, and way before that. Speaking strictly for myself, I love thinking about this kind of stuff, but I never wish for it out loud. And that's because I don't want the story to end. I love watching it unfold. If the story never changed, it really wouldn't be all that interesting to me. And unfortunately, there's a darker side to hearing people wish that Phoenix could just go back to the "way it was". And it has to do with just dismissing everything that can be done. 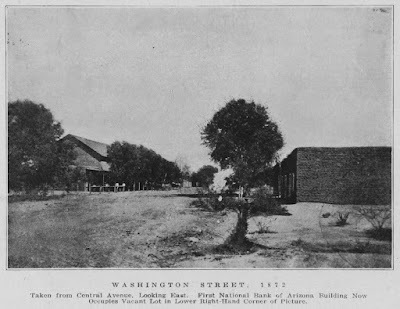 There are so many things that can be done to preserve the history of Phoenix, and so many ways to make the future integrate the past, that I can't even begin to list them in this post. People are working on that kind of stuff right now. Some of them are doing big things, some are small. Some are just voices, like mine. But for the people who simply dismiss it, and walk away after saying "I just wish Phoenix could go back to the way it was", they don't do anything. They simply make a statement, shake their head, and see if something good is on TV, or something. I wish this weren't true, but it is. And I guess people can feel small and helpless, as if "they" were doing stuff, changing the world around them. But I've never thought that way, and I know that it's not you. I know that miracles happen, and sometimes they start with tiny things. I've often despaired, and then I get myself up, dust myself off, and see if I can be more optimistic. I collect photos, and post them on the web, and I really do hope that the right people see them, and think "hey, that's pretty cool, let's integrate that historic building into the redevelopment". I know that those things are happening, and I'm optimistic that they will continue to happen. I like to time-travel, and visit Phoenix in space and time, but I live in reality, and that includes the wonder of air conditioning, and the good people who are continuing to write the story of Phoenix. Image at the top of this post: Looking east on Washington from Central in 1872, Phoenix, Arizona.